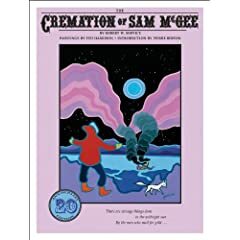 And in case you weren't aware, Kids Can Press recently released a 20th anniversary edition of The Cremation of Sam McGee with Ted Harrison's paintings*. I've had it for about a week and I've paged through it at least once a day. It's well worth a look, both for the fabulously vibrant artwork of Ted Harrison and as an introduction to Service (if you aren't already acquainted). Love it. *Check this out. Rad, right?